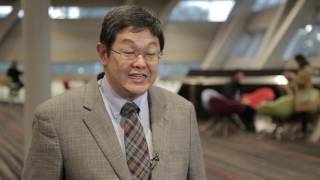 Winston Tan, MD of Mayo Clinic, Jacksonville, FL discusses a treatment of bone metastases in prostate cancer. Dr Tan mentions that addition of bisphosphonates does not increase the overall survival of patients suffering from various cancer types, including breast cancer, prostate cancer, and renal cancer. Cabozantinib, approved for metastatic renal cancer makes the bone metastases disappear, however, it has not been shown to increase survival in patients with a metastatic prostate cancer in a phase III randomised clinical trial. A combination of two or three drugs may be required to achieve better results in patients. The next step would be to look at markers, a combination of targets and drugs which can work together to help improve survival and prevent the consequences of bone metastases. Dr Tan highlights the importance of supportive care for cancer patients, who can benefit from an access to physical therapists, psychologists, and nutritionists. This could mean less bone pain and decreased use of pain medication, which may cause dizziness, constipation, or reduced mobility. Ongoing studies in the metastatic prostate cancer compare the micro-environmental factors, before and after the treatment to better understand which genetic and metabolic factors affect the bone metastases. Dr Tan says that prostate cancer patients with bone pain should be offered Radium 223, which improves survival and long-term can improve the symptomatology, and bisphosphonates, or denosumab, which is known to prevent skeletal-related events. Recorded at the Multinational Association of Supportive Care in Cancer (MASCC) and International Society of Ocular Oncology (ISOO) 2016 Annual Meeting on Supportive Care in Cancer held in Adelaide, Australia.